City of London MP Mark Field had a ringside seat in 2008 as the global financial system was sucked into a spiral of crisis. With one foot in the Westminster village, the other in his central London constituency, Field had access to a unique mix of politicians, financiers and business people in the feverish months and years that followed. A collection of his short contemporary essays and speeches from 2007 to 2012, Between the Crashes provides a timeline of the financial crisis, its aftermath and the ensuing travails of the eurozone as well as an account of the challenges facing the Brown and coalition governments. In doing so, Between the Crashes pulls together some of the overarching themes set to define the early part of the twenty-first century – the shift of power eastwards, generational division, disillusionment with capitalism and the political class and, most of all, the impact of colossal Western debt. 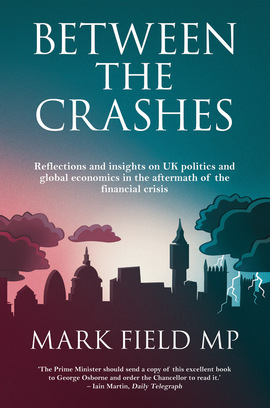 In providing robust analysis of the UK’s problems, Mark Field puts forward some practical solutions for the future, challenging the political class at a time of stagnant growth in the British economy. And, as its title suggests, Between the Crashes finally asks: is there more to come? The Prime Minister should send a copy of this excellent book to George Osborne and order the Chancellor to read it.